 On 16-17 November 2017, the second Al-Maktoum College of Higher Education Building Bridges Symposium focuses on the topic of Interfaith Dialogues and Art. 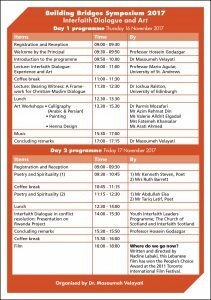 The two-day event, run in conjunction with Scottish Interfaith Week, is aimed once again at embracing diversity and tolerance and encouraging positive dialogue between different faith groups in a stimulating, unique environment at the College’s Dundee campus. Those who attend will have the freedom to share their views and it will benefit those seeking to build bridges of friendship while expanding interfaith trust. Delegates will be offered lectures on, among other subjects, Experience and Art, A Framework For Christian/Muslim dialogue, and young volunteers involved in interfaith activities will share their experiences. Keynote speakers, pre-eminent in their academic fields of study and research from the Universities of St. Andrews and Edinburgh, will provide interesting and thought-provoking talks to encourage questions and discussions. The wide-ranging, two-day programme covers a lot of ground in its bid to foster open and considered debate. Poetry, music, art workshops, including calligraphy and henna painting, will feature and the event will be brought to a close with a moving Lebanese film, won the People’s Choice Award at the 2011 Toronto International Film Festival. The film is set in a village in habited by Muslims and Christians, where women unite to keep their men from fighting each other, reduce sectarian violence and bring peace to the village. Professor Hossein Godazgar, Principal and Vice-Chancellor of Al-Maktoum College, is looking forward to welcoming delegates who wish to examine and hear more about interfaith dialogues in the context of art. Professor Godazgar said: “We are opening our doors in this way for the second time as part of our aims to promote religious freedom, pluralism and shared understanding in the 21st century. “Our inaugural symposium in 2016 proved to be a success as it engaged people from many different walks of life who all wanted to examine the ways we can build bridges between Muslim communities and societies, and non-Muslim communities and countries, which is our core mission at the College. This event is FREE, but registration is required. To register through Eventbrite, please click here.